SHS junior Dan Fortier has already become a writer of note. Dan entered an outstanding essay on the topic of freedom and liberty for the annual Sons of the American Revolution Essay Contest. The SAR Essay Contest in honor of George S. and Stella M. Knight is designed to give high school students an opportunity to explore events that shaped American history. At Chapter, State Society, and National Society levels, students must submit an original essay, with topics based on original research and deal with an event, person, philosophy, or ideal associated with the American Revolution, Declaration of Independence, or the framing of the US Constitution. Winners earn a cash award. Earlier this year, Dan’s AP US History teacher, Mike Welch encouraged his students to complete a variety of essays to practice writing and exercising their historical thinking skills. Dr. David Schrader, a Sandwich resident and the educational director for the Massachusetts Society of the Sons of the American Revolution made Mr. Welch aware of this annual opportunity three years ago. Dan decided to take up the opportunity and began a process of writing and revision, shaping his essay into a wonderful original narrative about the concepts of liberty and freedom, what they meant in America at the time of our founding and what those concepts mean to us today. 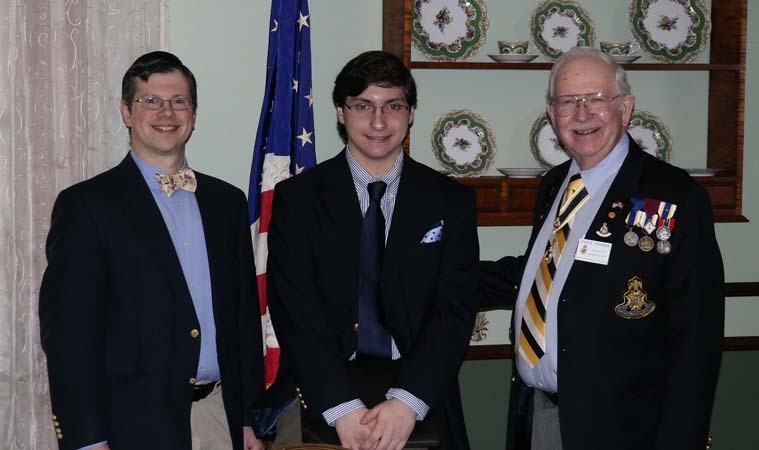 Dan was honored at the Cape Cod Chapter’s meeting in March, which was held at the Dan’l Webster Inn. Dan read his essay to the members and guests in attendance, which included Dan’s parents and Mr. Welch. Dan has not only completed serious research and written an exemplary essay worthy of publication, he also won first place in the Cape Cod Chapter level contest, and second in the Massachusetts Society level contest. This is a great honor; an accomplishment of which Dan and his community ought to be proud.